28 roses - We have roses in many colors such as red roses, pink roses, white roses, yellow roses, orange roses etc. 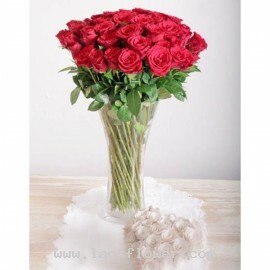 A vase of 28 long-stemmed red roses. We can add a beautiful ribbon on the vase. * Customers can choose the color of roses that you like. Occasionally, substitutions may be necessary to create your bouquet due to the availability of certain flowers in various parts of the country. 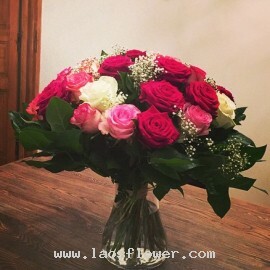 Substitutions ma..
A vase of 28 roses included red, pink, and white roses accent with white gypsophila flowers. This vase is the perfect gift for 28th birthday or sending as wedding anniversary gift. * The color of roses can be changed. Occasionally, substitutions may be necessary to create your bouquet due to the ..